The birth of the Internet set the course for the technological advances that we see unfolding today. Not only has technology leapt in development, it is also completely intermingled with every practicality of our lives. It is therefore not surprising that these changes have had an immense impact on the Education Sector. One of the changes we’ve seen over the past decade is a shift to automation of management of Institutions. The ease of communication along with access to valuable information has become the heart of management for most institutions. This means SIS is no longer a luxury, but a necessity for most 21st Century Education Institutions. 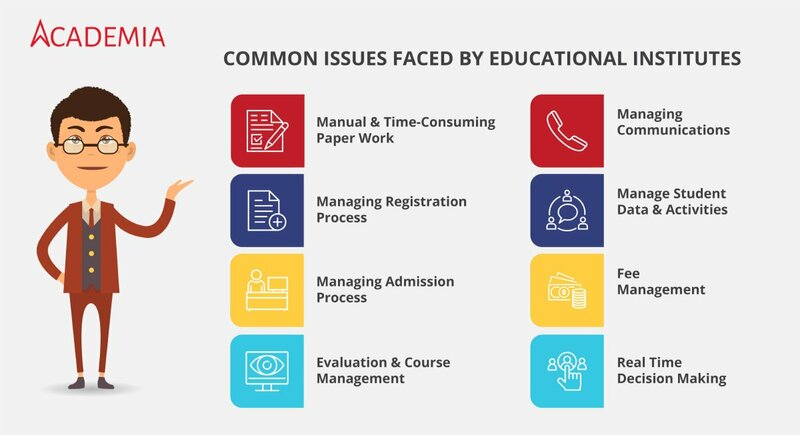 Student information systems like Academia help institutions manage various departments, sub-departments and even multi-locational institutions successfully. Here are some areas where Academia can offer simple solutions to complex problems. Manual paperwork is a given when it comes to managing an institution. Administrative staff spend most of their time on repetitive and time-consuming tasks. With an SIS, these tasks are automated, making it easier. It also saves valuable time and makes the process more seamless. Automation of registration means that students no longer queue on registration day. Students can now pay fees, enrol for courses and process registration via an online system. An SIS allows institutions to manage the entire admission process, start to finish. With an automated system, institutions can manage campaigns, handle enquiries, send out follow-ups and reach admission targets efficiently. Create and manage course material for different programmes via the SIS. Define lesson plans for courses, map faculties to different courses and assign topics to faculties. Homework assignments, examinations and evaluation are all tasks that can easily be managed while using minimal resources. Easily communicate between users with internal notifications, e-mails and SMS. Connect students, teachers and administrative staff with a central communication system. Student information is available at the touch of a button. With real-time monitoring, management can track student activities from attendance to performance. The automated process makes it easy to manage student profiles. Collecting fees is no easy task. All students do not have the same fee structures and keeping track of payments manually can be cumbersome. An automated system means it is easy to keep track of fees efficiently. At the touch of a button, the history of payments and information on outstanding fees are available. Management can immediately see what needs to be paid and what services are owed to students. Access to data in real-time means management can make an informed decision, with reporting that processes big data to manageable information sets. Interested to see how Academia SIS can simplify your Institutions complex problems? Visit our website to learn more or book a demo.